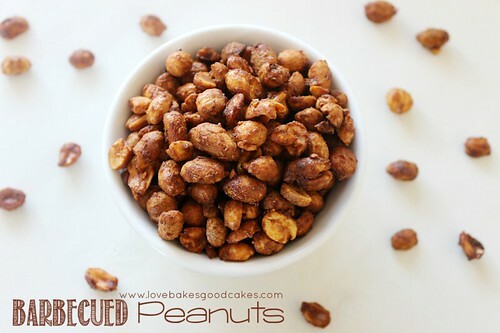 I am sharing my most awesomely addictive Barbecued Peanuts with y’all today! ‘Tis the season of finger foods! What?! You didn’t know finger food season follows cookie season?! Have you looked around bloggy-land lately?! Between New Years’ Eve party food and Super Bowl food, I’m pretty sure there is a finger food season. I’m just sayin’. The great thing about finger food season is, you can eat little bits of lots of different foods and call it a meal! I don’t know about y’all, but I love finger food – wings, chips and dips, muddy buddies, veggie trays, smokies wrapped in bacon, popcorn ….. seriously, what’s not to love?! These Barbecued Peanuts will make a great addition to your New Years’ parties, your Super Bowl parties … and they’re great anytime snacks – you don’t even have to have an excuse or a party! The recipe couldn’t be simpler ….. Let’s see how we do it, shall we?! Preheat oven to 325°F. Grease a large baking sheet and set aside. In a large bowl, combine the barbecue sauce, butter, garlic powder and cayenne pepper. Add the peanuts and stir well, coating the peanuts evenly with the mixture. Bake for 25-30 minutes, stirring every 10 minutes. After the bake time, spread the peanuts evenly on waxed paper to cool. Allow to cool completely before storing in an airtight container. I am from Alabama where they discovered and grow peanuts but have never heard of BBQ peanuts. I cannot wait to try this. Thanks for sharing on the Wonderful Wednesday blog hop. I am co-hosting with Duck's n a Row. I will pin this. I will also make sure I am following all of your social medias. These will be awesome at a Super Bowl party! It would be our privilege to have you share this at our weekly Super Saturday Link Party. We go live on Fridays at 8. http://www.madefrompinterest.net. Jamie, I think David is going to love these. He does love any kind of nuts and BBQ. Can't wait to make them for him. Pinned and shared on twitter and Facebook. These look SO good, Jamie!! Can't wait to make them sometime soon. Pinning! I am so going to try these peanuts! I bet they are addictive…. 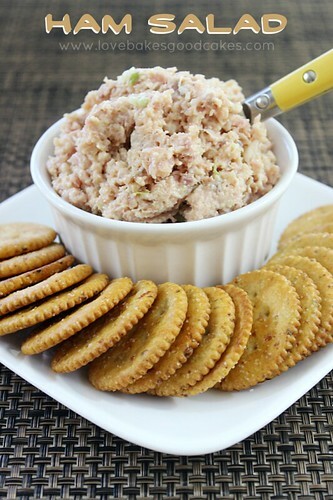 What a great snack to serve at a football party. This is such a great idea! Pinning! These look delicious! I have never had BBQ Peanuts before! Pinning to our party board and my Super Bowl Board. Thank you for coming to Family Fun Friday! Blessings! Also…I am going to feature your recipe during this week's party at Family Fun Friday! It is unique and could become a family favorite! 🙂 Blessings! Thank you for linking at Show Me Your Plaid Monday's!!! You have been Pinned! What a great idea… seasoned nuts are so over priced in the grocery store. Terrific for football game. Thanks for sharing this with us on foodie friday. OMG seriously? Fabulous idea! Can't wait to try them. Thanks for sharing at Simple Supper Tuesday. bookmarked this recipe ! yummy! It's 4am (really) and I'm wanting some barbecued peanuts. I'll be making these later today. Thanks for sharing at Inspire Us Thursday on Organized 31. I swear Jamie. 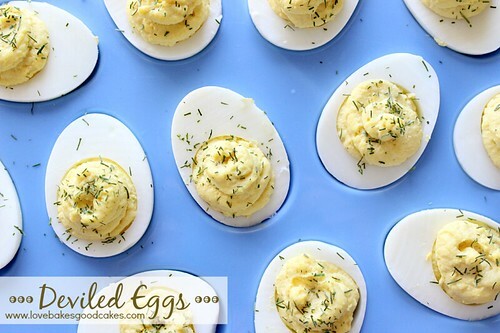 I've seen this recipe a thousand times and if I don't make these by the end of the week, I'm going to go crazy. They're haunting me. Thanks so much for always linking up at Thriving on Thursdays. I'm featuring this one at tomorrow's party. Congratulations! This post will be featured over at Diana Rambles tomorrow and has been pinned in the Featured at Diana Rambles board at Pinterest. Please grab a featured button off my sidebar or via the link under the features. Thanks for sharing this awesome idea! These look amazing! I can't wait to try them. I love anything barbecued. Pinning! I haven't ever thought of this being finger food season, but you are so right! 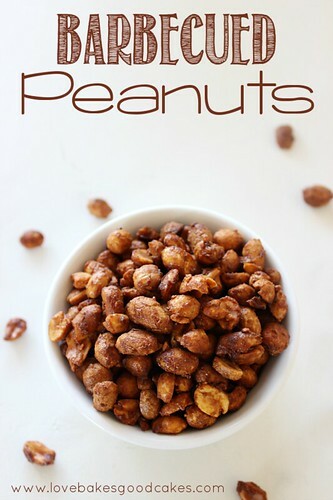 These BBQ peanuts are a perfect addition for this snacky time of year. Thanks for sharing these with us at Saturday Night Fever, Jamie. We are so happy to have you join us! I'm laughing like a fool over here after reading your fb status. Because I'm a mom of an almost 12 y/o boy. These peanuts look really good, Jamie! Thanks for sharing.